Drawing on original manuscript sources, David Maxey has produced a persuasive study of a late-18th-century portrait & its subject. He has focused attention on an enigmatic painting that has long puzzled art historians, & the person portrayed in it--a woman of talent & verve, whose life has remained undeservedly obscure. 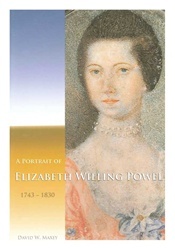 Elizabeth Willing Powel occupied an influential position in Philadelphia society during & after the Revolution. She presided over a salon; spoke her mind freely; & maintained, for a period of 40 years, an extensive, illuminating correspondence. She was the trusted confidante of the country’s first president, whom she did not hesitate to instruct on where duty summoned him. Personal loss touched her deeply, & at a critical moment, the Philadelphia limner & sign painter, Matthew Pratt, was commissioned to capture on canvas the grief she experienced. What happened thereafter to the portrait Pratt painted becomes an essential part of the mystery that David Maxey has successfully undertaken to solve. This monograph will fascinate art historians as well as early American historians. Color portraits.